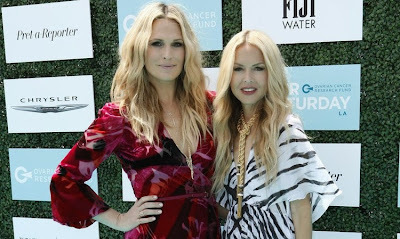 Molly Sims and Rachel Zoe hosted the second annual Super Saturday LA to benefit the Ovarian Cancer Research Fund. Model/actress Molly Sims and fashion stylist Rachel Zoe hosted an amazingly fun and stylish event on Saturday at the Barker Hangar in Santa Monica that benefited the Ovarian Cancer Research Fund. The second annual Super Saturday LA featured luxury designers offering clothing and accessories at big discounts, as well as tasty treats from Sprinkles (yay! ), Otis Spunkmeyer and Fiji Water. Not only was the shopping-heavy event kid-friendly -- CC and Will had a blast at the Hasbro, Books & Cookies, and Just Dance booths -- Super Saturday LA was also pet-friendly. We almost took home a corgi mix puppy from Wags and Walks! All proceeds from sales went to support ovarian cancer research. What a great way to spend a gorgeous Saturday afternoon! Check out more photos from the event on my Instagram feed, and read my full story over at mom.me.